The delicate balance between independence and exposition that the current Marvel Cinematic Universe has heretofore mastered flies off the rails in Thor: The Dark World. In many ways, the first Thor outing was the key contributor to the spectacularly popular Marvel’s The Avengers, from one of its heroes to its panoply of foes. The same with probably be the case with Thor 2, with lots of yammer about Aether and Infinity Stones and a convergence of interstellar realms. But, the fish-out-of-water charm of the Thor, the Mighty Avenger (which carried over The Avengers) gets lost in the blur of this special effects-laden hodge podge filtered through a production that includes three credited screenwriters plus multiple reshoots and rewrites. 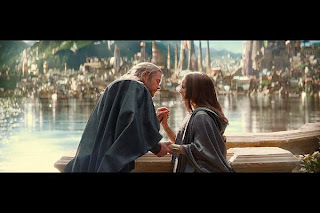 As Thor (Chris Hemsworth) is polishing off some uprisings that temporarily engulf the Nine Realms, his Earth-bound sweetheart Jane Foster (Natalie Portman) gets sucked into a vortex that puts her face-to-face with an energy force called the Aether. The Aether occupies Jane’s body, prompting Thor to transport her to Asgard for treatment. Unfortunately, the Aether’s release awakens Malekith (Christopher Eccleston) and his un-merry band of Dark Elves (see also, Romulan lookalikes), bent on capturing the Aether and reviving their ancient war to destroy the universe, starting with Asgard. When Malekith and company come calling, a desperate Thor enlists the aid of his disgraced brother Loki (Tom Hiddleston), springing him from a life prison sentence given for the Big Apple mayhem he wrought in The Avengers. The Asgardian setting smacks of Middle Earth crossed with Naboo—some of Portman’s garb looks like Amidala hand-me-downs. But mostly, the interdimensional hopscotching is devoid of charm and reason. Problems arise and are solved without any rational explanation outside of Thor’s omnipotent hammer. As for the supporting characters on Asgard, Idris Elba is still wasted and Anthony Hopkins is cashing a check. Rene Russo gets a couple of good moments, but mostly I found myself staring at Jaimie Alexander for two reason: her beauty and those rumors that she might be cast as Wonder Woman in the next Superman film. Back on Earth, Kat Dennings plays Jane’s gal pal Darcy like just another annoying Broke Girl, while Stellan Skarsgard spends most of his screentime running around with no pants on (seriously). The lone levity comes compliments of Hiddleston, who is even more at ease in his third go-around as Loki (his funniest gag incorporates a cameo from Chris Evans). He alone provides any discernable emotional range, and when a superhero movie has you rooting for its treacherous, murderous villain, you know something’s amiss.